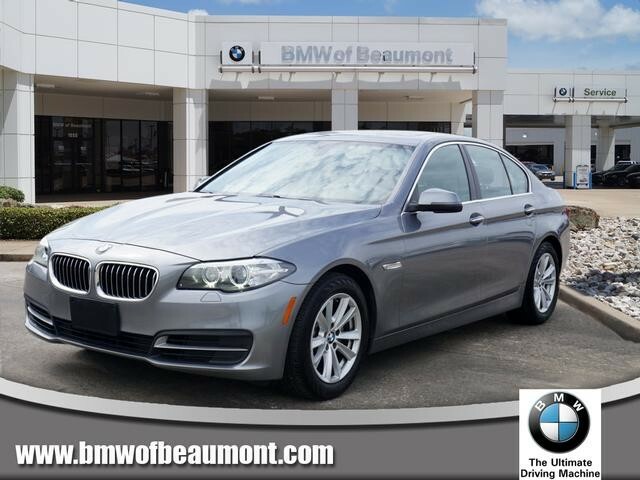 We are excited to offer this 2014 BMW 5 Series. Your buying risks are reduced thanks to a CARFAX BuyBack Guarantee. This vehicle is Certified Pre-Owned. Quality and prestige abound with this BMW 5 Series. The greater your fuel-efficiency, the less your carbon footprint. And with exceptional MPGs, this BMW 5 Series treads ever so lightly on Mother Earth. The 5 Series 528i has been lightly driven and there is little to no wear and tear on this vehicle. The care taken on this gently used vehicle is reflective of the 45,818mi put on this BMW. More information about the 2014 BMW 5 Series: The BMW 5-Series stands out as a traditional luxury sport sedan that not only offers strong, uncompromised performance but also some leading-edge safety and connectivity technology. Increasingly, the 5-Series has an advantage over most of its rivals in that it offers more fuel-saving measures than most other sport sedans, with items such as Auto Start/Stop, turbocharging, direct injection and a special Eco Pro driving mode combining to provide significant gains in gas mileage. A new diesel model, the 535d, adds another way to save fuel. Otherwise, the 5-Series sedans offer more comfortable, refined cabins than some other sport sedans, and the 5-Series Gran Turismo body style is a good pick for those who want a little more cargo flexibility. Strengths of this model include refined, luxurious interior, active-safety features, responsive handling, Eco-conscious performance, and leading-edge tech options We look forward to seeing you soon! Please call us for more information.